Trying out a range of rums, brandies and whiskies at a trade show is a great opportunity for me to try out new flavours, learn more and give an added dimension to what could be a potentially ‘dry’ historic study of the world of punch. 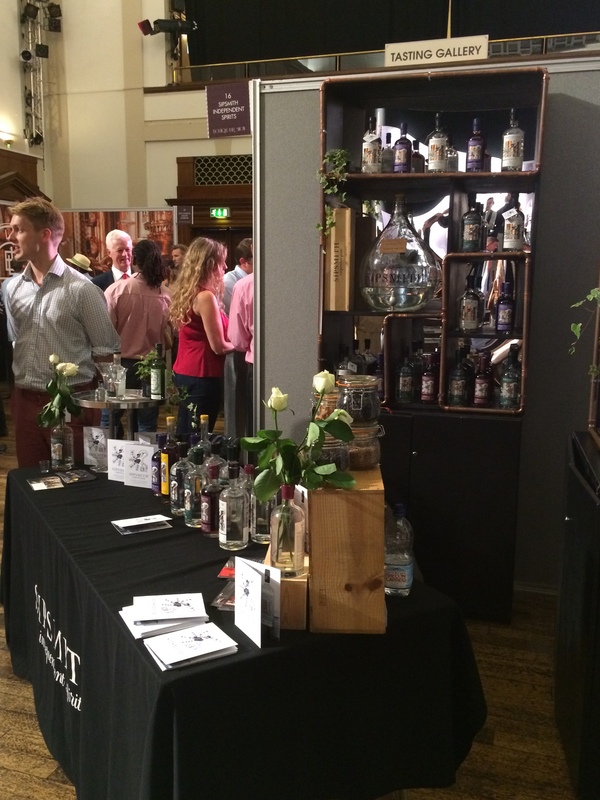 Luckily, I was in London on the first day of the Boutique Bar Show. Organised by Andrew Scutts, the show is relatively small, with 38 stands, aiming at promoting new and high quality drinks brands to the UK drinks industry through tastings, talks and classes on current trends, production methods and styls, as well as hosting a trade show with producers and suppliers of drinks and bar equipment. It appeals to all those working in bars, restaurants and anywhere where quality drinks are served. This was the 7th year the show was run, held at the Camden Centre, an art-deco building dating back to 1937, opposite the newly renovated St Pancras International station (views of the show below). 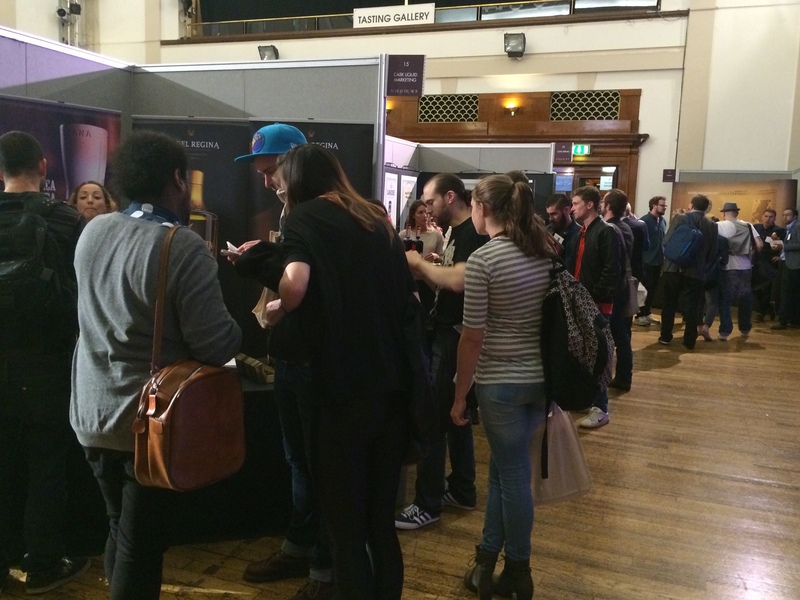 The London show included 13 seminars over the two days included sessions on business: management, marketing, techniques and understanding the customer. The seminar on how to improve business through social media with Warren Knight, clearly illustrated the complexity in selling a business, whether it is a bar, restaurant, services – or even a book! Other sessions were held on around tastings and cocktails (see below for the session I attended on punch). 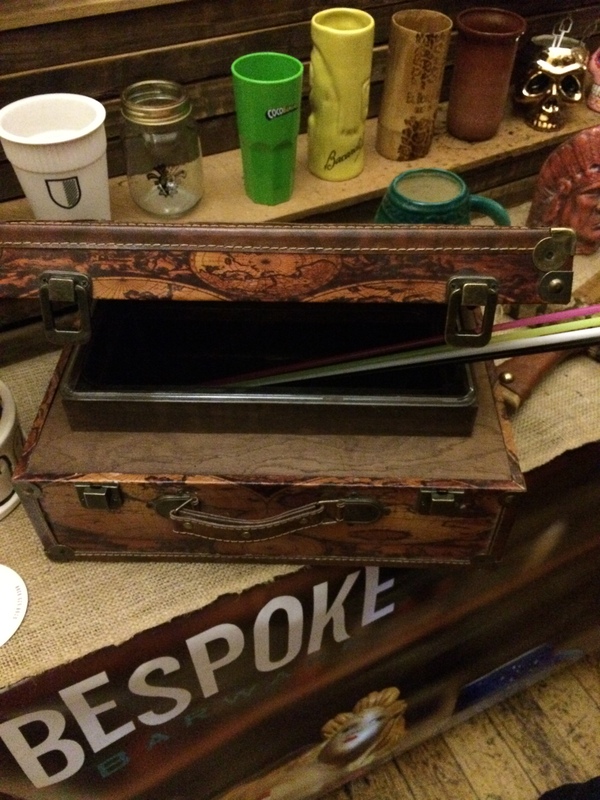 One of the stands selling equipment was Bespoke Barware. 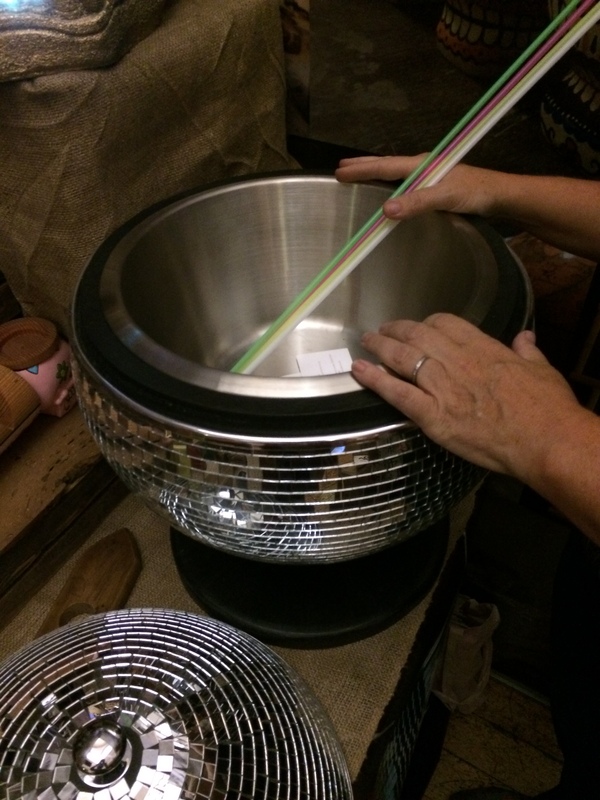 Trays of shot glasses, straws, ice buckets and… punch bowls! 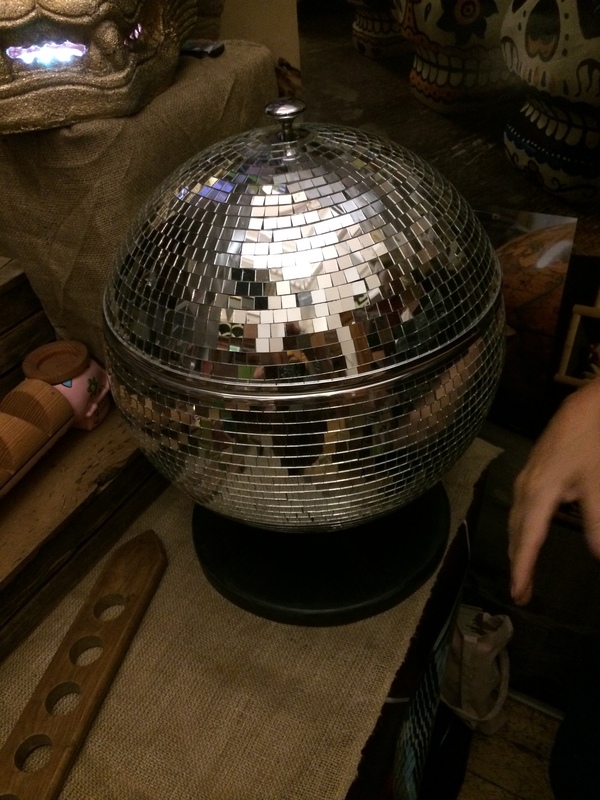 Bowls out of which the drink could be ladled or communally drunk from with straws, shaped like gold fish bowls; modelled out of mirrored disco balls, in adapted ‘old’ suitcases, china pineapples, giant clam shells. 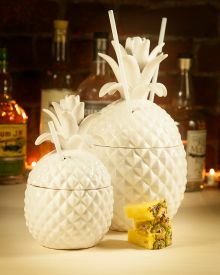 I particularly liked the idea of the white ceramic pineapple punch bowl which harked back to the 17th and 18th centuries. Pineapples were a symbol of hospitality and the rarity indicated wealth. In punch they were sometimes used to flavour the rum. Tasting a range of spirits, especially rum and whisky proved to be a fascinating experience. Knowing the differences in theory is always very different when applying to the reality of taste. As modern cocktail makers know, which spirit used can dramatically alter the taste, so when trying out historic punch recipes, when the type of rum or whisky is rarely specified, historic knowledge of how styles have changed, and the evaluation of the taste of the blend are important. A range of whiskies from Bruichladdich (established 1881 and purchased by by Rémy Cointreau in 2012) which illustrated the varying influences of the barley, casks and peat. The Classic Laddie: A fresh clean whisky made from Scottish barley with no peat character which had a salty fresh acidity, with a delicate sweet, ripe nutty caramel character. Isla Barley 2007: Expressly not peaty in style, which allowed the amazing character of the barley grown on the island of Isla to shine through. The maritime influence led to a whisky with a pronounced salty aroma and taste, a powerful salty minerality and a strong structure. Stony dry, this was an austere style. Black Art: made with five different casks made with American and French oak – 500l size. 23 years old with a cask strength of 49.2%! This whisky revealed the importance of the cask in flavouring. Rich, nutty and with almost a bitter chocolate character. A classic spiciness and a combination of sweet and saltiness. Octomore: With an amazing 160 ppm – the heaviest peat level in the world. So dry and salty it left my mouth tingling. 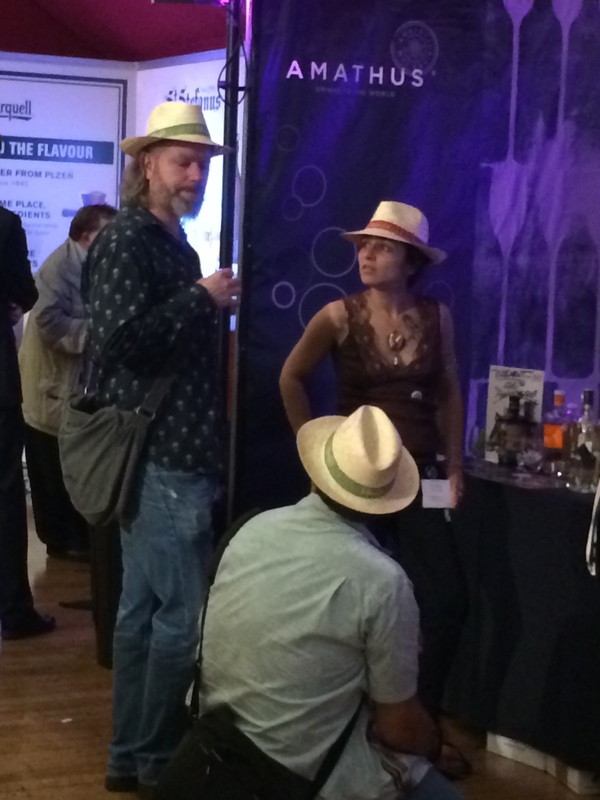 I tried a range of rums on the The West Indies Rum and Spirits Producers Association (WIRSPA) table. The lady at the stand was great when I explained that I wanted to taste a range with very different styles and gave me these seven out of the vast range on the table to start me off. The choice of rum when making punch can alter the taste enormously. St Nicholas Abbey, Barbados. White rum. Banana aromas, raspberry ripple ice cream, coffee. Clarkes Court, Old Grog, Grenada. Pale gold, more spirity aromas, bananas, nuts, salty. Barbancourt, 15 year old, Haiti. Resembles a Cognac. Darker, amber. Very woody, dry, mouth tingling. Quite a restrained style. El Dorado, 15 year old, Guyana. Even darker amber. Floral, honeyed, hints of coconut, much sweeter. Apparently sugar is added. Ron Barcelo Imperial, Domenico. Top brand in Spain. Nutty, oaky aromas, fiery, oaky dry. Almost bitter. Angostura 1919, Trinidad & Tobago. Caramel and nuts, tarry, liquorice, perfumed. Very strong. Doorly’s Barbados. Double maturation in cask. Strong caramel aroma, dry, salty, nutty. English Harbour, Antigua. 5 years old. Earthy, lighter, hints of coffee. 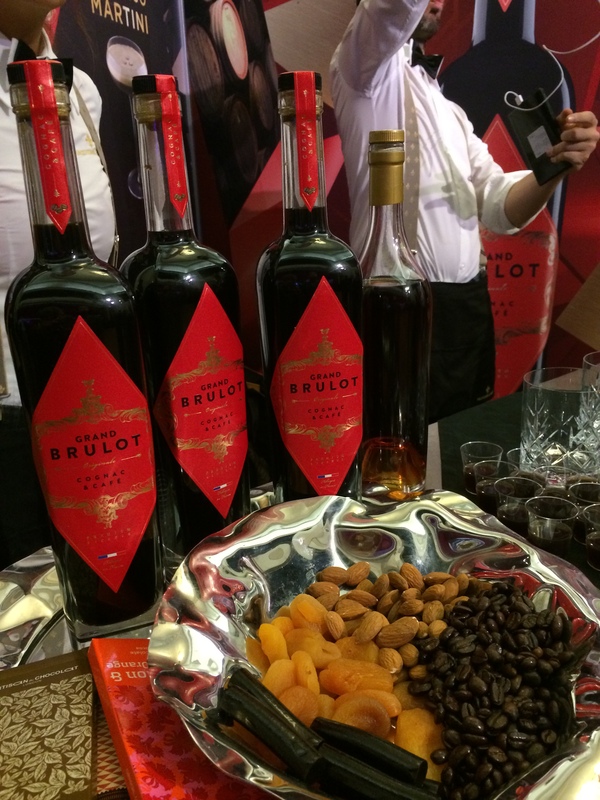 Bottled Grand Brulot with a plate of dried fruit, coffee beans, nut and cinnamon reflecting the flavours found in the drink. I also tasted my first Café Brulot with director of Grand Brulot, Romain François. This drink is made with 10 year old cognac, specially blended to combine well with a coffee made with Arabica essence to avoid any bitterness. The coffee and cognac are infused together for 12 months in oak. I had not expected such a rich taste. and loved the aromas of toast, coffee and chocolate and the powerful bitter chocolate on the palate cutting the rich sweetness. Café Brulot is a traditional Christmas and New Year drink from New Orleans. One reason I was particularly keen to go to this show, was a talk on Cocktail Trends with Spritzs, Shrubs and Punch. The small lecture theatre was packed, but, with little time for discussion it was impossible to know whether the attendees already made these drinks or were curious to know more. Each speaker had 20 minutes to talk and offer a tasting sample, introducing the different styles of drink. The spritz was promoted as being an alcohol-aware drink, with the alcohol being diluted. The talk on shrubs treated the drink as something distinctly different to punch, concentrating on the vinegar acid element. 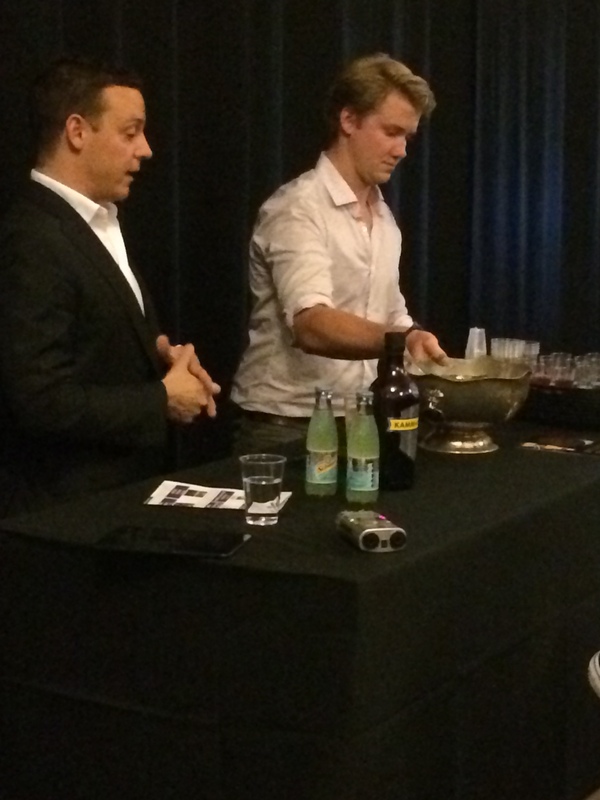 The punch presentation was given by Davide Segat, the bar manager at the London Edition Hotel, Berners Street. 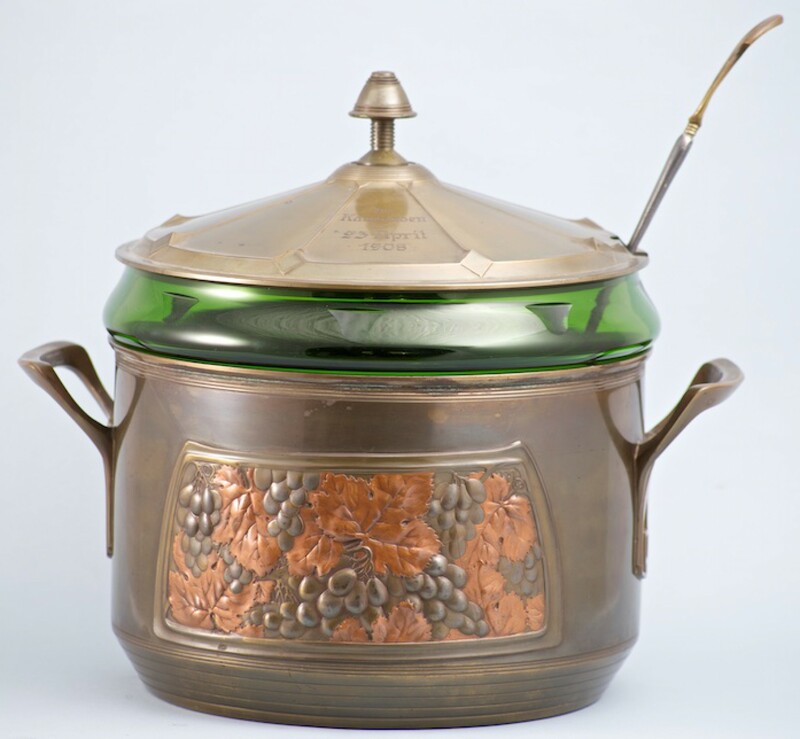 The hotel, which opened in September 2013, includes a Punch Room (see next post), so Segat was in a good position to talk about the commercial realities of making punch. His biggest obstacle is overcoming clients’ bad experiences, often at student parties, but offering visitors a small glass to show them the quality of the drinks is a good introduction. He proposed that tea was the original weak ingredient in punch and that the spiced tea, Masala Chai, also provided the spice. However, any tea can be used, with each type of tea giving a different flavour. As soon as the tea is added to the cool punch mixture it will stop infusing and will not continue to get stronger. Any spirits and alcohol can be included, including Martini. We then tasted a punch made with Martini Rosso, lemon juice, sugar, water infused with basil, hibiscus flowers and grappa. Martini Rosso has a very strong and identifiable herbal aroma which dominated and was further emphasised by the basil. This suggested a fairly powerful and gutsy taste to follow, but the taste was surprisingly delicate. 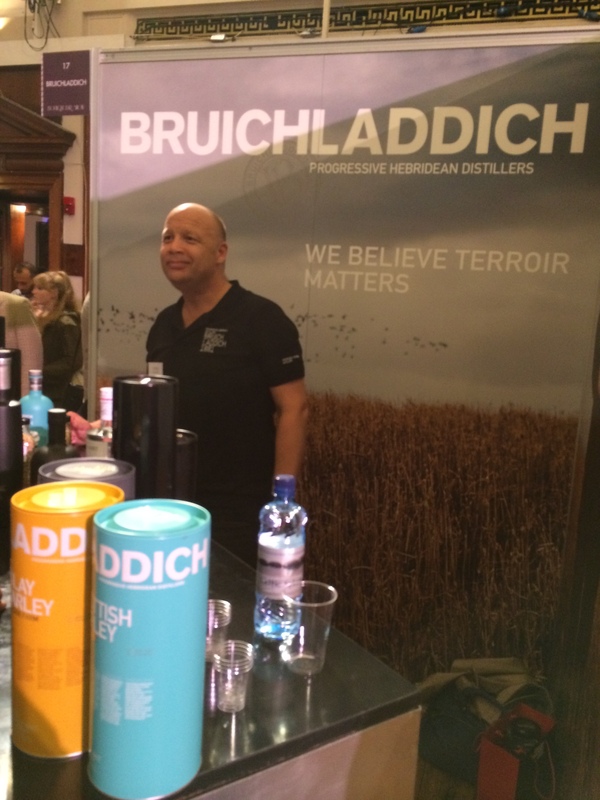 I would have liked to attend some of the other masterclasses but there was not enough time to attend and go round tasting – so I am now looking forward to going to the Edinburgh Boutique Bar Show (The Mansfield Traquair, 5 Mansfield Place, Edinburgh. Wednesday 22nd October) to learn more.